Barcelona have tweeted confirmation that midfielder Denis Suarez is not training with them tonight as he resolves his future. While Arsenal are not mentioned in the tweet, this only seems a further hint that Suarez is edging ever closer to making a move to the Emirates Stadium. ?? Último entrenamiento de los jugadores disponibles del primer equipo en el campo Tito Vilanova antes de recibir al @SevillaFC en el Camp Nou. 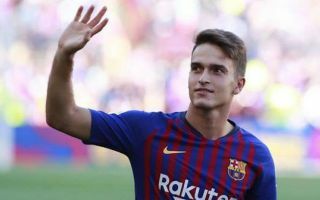 Denis Suárez no entrena pendiente de resolver su futuro. Completa la sesión Riqui Puig del @FCBarcelonaB. Suarez has not been a first-team regular for Barca in recent times, but makes sense as a signing for Arsenal given their situation in midfield at the moment. It was claimed earlier today by Fabrizio Romano that Arsenal had seen a loan bid for the 25-year-old accepted by Barcelona, moving the deal ever closer. Ernesto Valverde has also been quoted by Arsenic and others as saying Suarez is on the verge of joining the Gunners, so fans can start to get excited as it looks like something more official should be announced soon enough. Arsenal look in urgent need of any players they can get this January and should welcome the arrival of Suarez even if he is not the biggest name.